The capstone of the NFL offseason — the 2018 draft — is still weeks away, but a quick look at the players the Denver Broncos have acquired already gives hope that last season’s 5-11 record won’t be repeated. The Broncos have been aggressive in free agency, and as a deal-maker in the trade market, and the early returns are promising. Five different positions have been significantly improved by the talent that the Broncos have added. In March, the Broncos signed free agent Case Keenum to replace Trevor Siemian as starter. As a result, Siemian was traded to the Minnesota Vikings, Keenum’s former team. 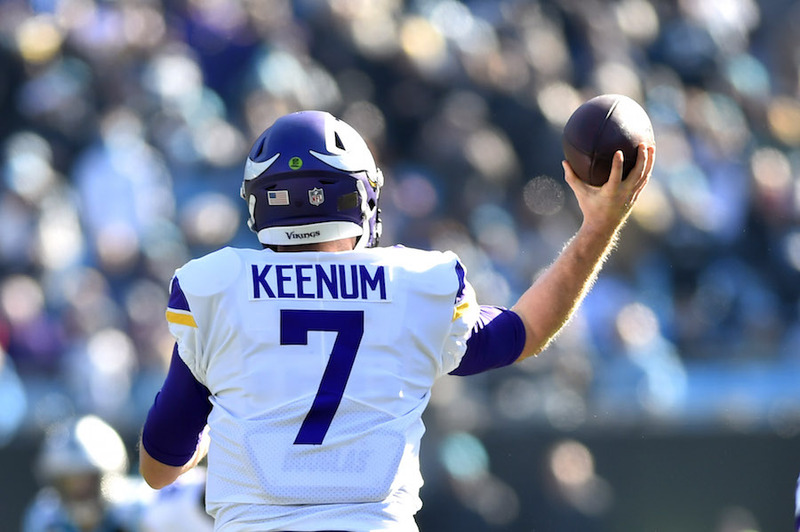 Keenum finished in the league’s top 10 in passer rating, interception rate, sack rate and completion percentage last season, while leading the Vikings to the NFC Championship. “Case is a great fit for us,” John Elway told the Denver Broncos’ team website. “He’s coming off a tremendous season last year, and has obviously been through a lot of situations throughout his entire career. Along with that experience, his leadership and competitiveness are what you look for in a quarterback. Case has fought and battled for everything that he’s earned in the NFL, and it’s exciting to add someone with that type of mentality to our team.” Keenum will walk into training camp as the unquestioned and unchallenged starter. The Broncos acquired tackle Jared Veldheer in a trade with the Arizona Cardinals as failed experiment Donald Stephenson departs the team as a free agent. Veldheer is a nine-year NFL veteran who has a ton of starting experience under his belt. During the 2017 season, Veldheer was injured after 13 games due to a fractured ankle, but his leadership and experience is expected to make the offensive line immediately better. Veldheer, a mountain of a man at 6’8″ and 330 pounds, will be taking over as starter for Menelik Watson, last season’s free agent addition. The Broncos signed defensive lineman Clinton McDonald as a free agent to a two-year contract. The nine-year veteran has spent four previous seasons with the Tampa Bay Buccaneers, and previously spent three seasons in Seattle. In 2017, he appeared in 14 games and totaled five sacks. Jared Crick and Billy Winn are leaving Denver as free agents after injuries derailed their seasons, leaving McDonald as an important part of a veteran defensive line that sports 33-year-old Domata Peko as its best inside rusher. The Broncos recently acquired Su’a Cravens in a trade with the Washington Redskins. Cravens, a safety/linebacker hybrid, was a second-round selection only two years ago. He had a successful rookie season with an interception, five passes defended and a sack, but he was forced to sit out of multiple games due to an arm injury. In the 2017 season, Cravens announced his decision to retire, and was placed on the Redskins’ reserve list, before he changed his mind and decided to resume his career. Still a very promising prospect at only 22 years of age, Cravens is not expected to start immediately as safety, but might be the long-term replacement for Darian Stewart. After the Oakland Raiders surprisingly cut King earlier this week, the Broncos pounced, inking the 29-year-old to a three-year, $7 million deal. The strong-legged King ranked third in the NFL in net yards per punt and is a perfect fit for Denver’s thin air — as well as for Broncos fans who don’t mind his Von Miller-esque dances after a boomer. King’s addition spells the end for Riley Dixon, who punted for the Broncos over the last two seasons. Not every position has improved, however. It’s impossible to argue that trading Aqib Talib to the Rams made the Broncos better, but given the realities of free agency, the downgrade could have been far worse. After sending Talib to Los Angeles, the team quickly signed free agent Tramaine Brock, an eight-year NFL veteran who played for the Vikings in the 2017 season, and previously played for the San Francisco 49ers. 2014 first-rounder Bradley Roby is expected to claim Talib’s place as starter, and Brock will take Roby’s position as backup. The 2018 NFL draft will run from April 26-28, and the Broncos — who pick fifth overall — can expect to add talent that will make an immediate impact, bolstering their chance to return to the playoffs this fall.